Dinnertime Etiquette – What’s Healthy For Your Dog? I’ve talked about how to choose a healthy dog food for your dog, but what about when it comes time to actually feed them? There are many different options that people have when it comes to feeding Fido such as once or twice a day, free feeding, supplementing food, etc. I’m going to talk about what is best for your dog and the possible health risks associated with certain options. Instinctually, dogs will eat until they are absolutely stuffed, and maybe then some. This is because in the wild, they never know when their next meal may be and they might have competition for their food from other members of the pack. Because of this instinct, you must be able to monitor your dog’s food intake and make sure that they are not over eating. Yes, they will always act like they are hungry, even starving, but that does not mean that they NEED more to eat. If you look on the back of your dog food bag, there will be a recommended amount of food for your dog based on their weight. You must remember that this is recommended and might need to be adjusted based on the amount of exercise your dog gets. The best thing to do is to consult with your veterinarian as to what amount of food would be best for your dog. Also, you must take into account that sometimes you should not base your dog’s amount of food given over the weight they are at currently (especially if they are overweight! ), but rather what their recommended weight should be as directed by your veterinarian. Many people, especially those who have only one dog, use the free-feeding method. While this method is easy and convenient, there are some health and behavioral risks associated with free-feeding that you might not be aware of. By free-feeding your dog, you are making food constantly available to them; this could have an opposite effect on their instincts and make them essentially unresponsive to food. This could pose a problem when trying to train because the dog might become no longer food-motivated. This method has also been known to create picky eaters. Their food becomes uninteresting and unexciting to them, and they will start to expect more. This could become unhealthy for their diet because many people start to try to supplement their diet with human food, which not only enforces this behavior, but can also pose a health risk to their digestive system. This method can also result in your dog becoming overweight (which comes with its own slew of health problems) because they are often eating way more than they should be, and most of the time without you being aware of it. Also, if your dog is not feeling well one of the first signs of being sick is lack of appetite. If you free-feed your dog, you will not really know when your dog has a lack of appetite. They could be eating half of what they normally do and you would most likely not even notice. So if you don’t free-feed, when are you supposed to feed your dog? It is best to keep your dog on a regular schedule i.e., feeding at the same time everyday. If your dog is fed too early in the morning, they might become a royal pain at dinnertime because they think they are starving to death. If your dog is fed too late at night, they might be waking you up in the middle of the night to go outside to potty. Try to find a schedule that fits best with your lifestyle and stick to it. If you have a very picky eater, it might be best to only feed them once a day in order to motivate them more to eat their meals. If you have a dog who tends to beg a lot and acts like they are starving to death all the time, it is probably better to feed them smaller amounts twice a day to alleviate their hungry behavior. Do not encourage your dog to become a picky, spoiled eater. If they do not eat their meal when it is offered to them, then take it away. Do not try to supplement their meals with leftovers or coax them to eat because that will enforce that behavior even more and they will start to learn that if they do not eat, something better will come. Instead, they will learn that they need to eat their food when it is offered to them or they will be out of luck! By following these guidelines and the behavioral guidelines from my last post, feeding time should become an enjoyable time for your dog, and a less stressful time for you! Have you had to deal with any of these problems during feeding time? What other methods have worked for you? First off, every dog should have good eating etiquette towards you. This means that they are not food aggressive. Starting when you first get your dog, practice taking their food (or rawhides) away from them and then giving them back. They need to know that you control the food and that it belongs to you first and foremost. They do not have an ownership over their food and therefore should never be aggressive over it. One trick that I like is to make your dog sit and stay before allowing them to eat. For example, prepare their meal and then make them sit and stay away from their bowl. Set their food down but do not release them right away. Make them wait until you release them with a command. This will help to signify to them that you are in control of their food and that they must listen to you if they want to eat. If they are protective over their food towards your other dogs, however, altercations can be avoided if you are aware of your dog’s behavior. Dogs should be fed separately in order to avoid any type of possible aggression, especially if you have a dog that eats faster than the other one and might bully them away from their food. This poses the problem of one dog overeating and one dog not eating enough, and also if the dogs are on different diets (such as regular and senior diets) this could potentially be harmful to their diet or in the least, upset their stomachs. Either feed your dogs in crates or separate rooms, or supervise feeding time to ensure no bullying, food stealing, or fighting occurs. If possible, the dogs should not be fed in the kitchen to reduce the behavior of begging for human food. By feeding in the kitchen they might start to think of the kitchen as where they get their food and in turn become “counter surfers” or bad beggars of your own food. Look out for my next blog post about more dinnertime etiquette – learning about when and how to feed your dog and what’s best for their health! In my last post, I said that I would discuss an alternative to vaccinating every three years after initial vaccines and boosters. That alternative is called a titer test. A canine titer test is a test that your veterinarian can perform; this would be done prior to the vaccinations due every three years. 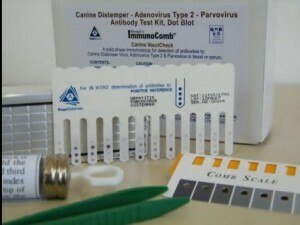 The titer test is a blood test that measures the level of antibodies your dog has to a particular disease. If your dog still has immunity to a certain disease, then the vaccine is unnecessary and could prevent potential risks associated with giving more vaccines. The test is a high or low reading (most of the time as a ratio) meaning, for example, if the titer test comes back as a high reading for parvovirus, then your dog still has a high immunity against the parvovirus. In some cases, specifically with high titer test results for parvovirus and distemper, it can be assumed that your dog also has a strong immunity to other diseases as well, especially ones that they have already been vaccinated for. Some things to consider with titer tests: some state laws require a regular rabies vaccine regardless of titer testing results, and some boarding facilities will not accept a titer test as a proof of current vaccination. The best advice I can give you is to be educated about your dog’s health and to also be aware of potential biases some people might have against titers. Do know that your veterinarian will most likely not offer up a titer test when you come in for your wellness exam, rather, if you would like one done, you might have to ask them yourself. Use your veterinarian as a resource and openly discuss the different options offered for your dog in order to decide what is best for them. What is your opinion on or experience with canine titer tests? You should always be educated on what vaccines your pets are being given and the timeline at which they should occur. Sometimes breeders will suggest certain vaccines that might not be needed for the area you live in and therefore should not be given to prevent adverse effects. 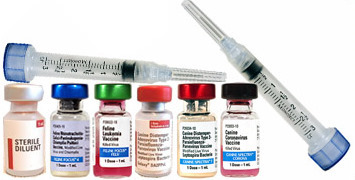 Here is some general information about the usual and recommended canine vaccine protocols. Between 6-8 weeks of age, your puppy should receive one dose of vaccine called DA2PP, which includes vaccines for distemper, parvovirus, adenovirus 2, and parainfluenza. This vaccine should be given every 3-4 weeks for a total of three doses. For example, at eight weeks, 12 weeks, then 16 weeks old. After these initial vaccinations, it is recommended that they receive a booster at one year of age, then after, every three years. Puppies are recommended to get their rabies vaccine at 16 weeks of age; a booster is usually required a year after, and then every 3 years after that. Any other additional, optional vaccines given should be considered before being given. These considerations include your demographical area and also the lifestyle of your pet. The bordetella (bordetella bronchiseptica) vaccine is used to prevent kennel cough and should be given if your dog is constantly at dog parks, groomers, boarding, dog shows, etc. where there is a high concentration of other dogs there. It is recommended that, if anticipated boarding or exposure to a high concentration of dogs, that the vaccine be given at least one week prior to anticipated boarding or other event. The lepto (leptospira) vaccine is something we don’t normally give in Northern Nevada. However, leptospirosis is seen in Northern California and in the Pacific Northwest (most common is dogs who are exposed to livestock or places that are frequented by wild mammals). The recommended dosage for this vaccine (if given) is yearly with the first vaccine given at minimum at 12 weeks of age with a booster 2-4 weeks following. The lyme (Borrelia burgdorferi) vaccine should only be given (if given at all) to dogs that live in areas that are known to have lyme disease problems (such as some areas on the east coast). There have been some reports on adverse effects from this vaccine, which makes it somewhat controversial. Look out for my next blog post where I will discuss an alternative to vaccinating every 3 years after initial vaccines and boosters! Do not feed your dog bones from the turkey (or any other meat). Cooked bones are very dangerous for dogs because they might splinter and cause major problems. Make sure that the leftover turkey is kept up high where your dog cannot counter surf for it! And when disposing, make sure they can’t get into the garbage; the best thing is to take the garbage out right away. As tempting as it is to give Fido leftovers, try to resist. Onions are toxic to dogs, and turkey skin contains a lot of fat that your dog might not be used to and it might be hard for them to digest (stomach ache!). Also make sure that your guests know not to feed your dog leftovers or check with you first. Sometimes it’s very tempting when they give those puppy dog eyes! With family members and friends coming over for the holiday, make sure your dog is comfortable with all the commotion. If your dog tends to bolt out of the door or gets uncomfortable around strangers (or young children) it might be best for them to be in a separate room with their food and water or in a crate where they are comfortable. As always when you have company coming over, make sure your dog has their ID tags on just in case a door or gate gets left open or your dog gets spooked and bolts out the door. If you have a young dog, puppy, or a high-strung dog, it’s a good idea to take them for a long walk to get them tired before your guests arrive. A tired dog is always a better-behaved dog! 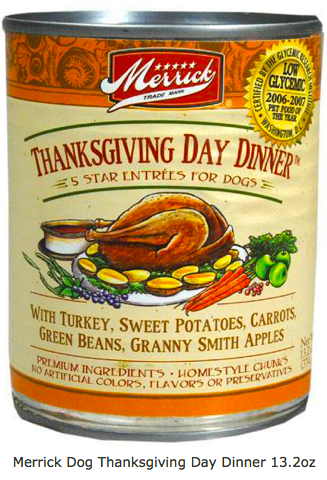 What will you do this Thanksgiving to keep your pups safe? Mine will probably get a little bit of this with their dinner! 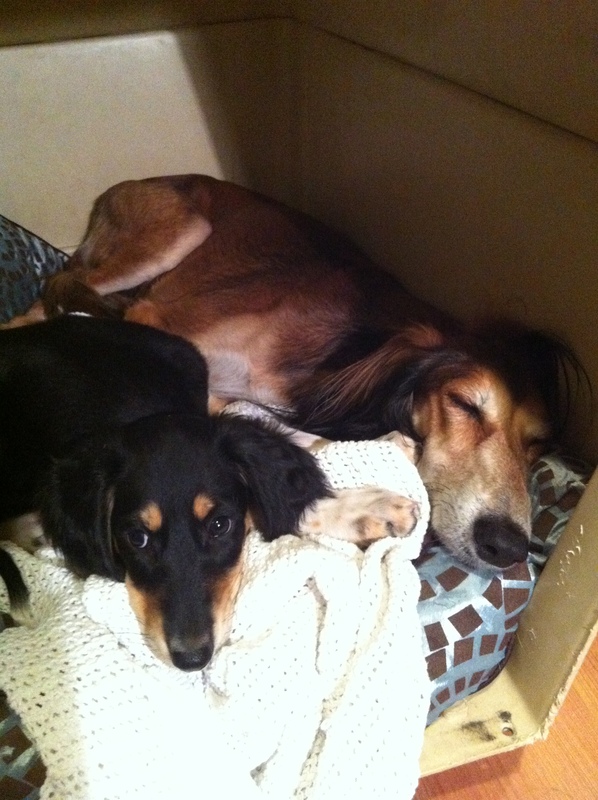 I am moving into a new apartment in one week and will be taking Zoey and Fāza (my puppy I kept from Zoey’s litter). Many people don’t think about the stress that moving might have on your dog(s) because they are too wrapped up in the stress that moving has on them! But the truth is that dogs are very observant and know when there is something different happening, and that might be pretty scary for them. Dogs like consistency in their lives and when you all of a sudden change their familiar surroundings and routines, this might cause a lot of unwanted stress. 1. Safety comes first! With people and movers going in and out of your house, you want to make sure your dog is in a safe, confined place. Whether this is in a crate, shut in a locked room (so movers don’t open it! ), or in the backyard, you don’t want your dog getting out of the house or getting in the way of movers. Also make sure that your dog has their ID tags on just in case they get out of the house or the car during the moving process. 2. Keep with the routine. If possible, throughout the moving process, try to keep their routine as consistent as you can. Feed them at the same time every day, don’t skip their daily walks or playtime, and try to keep their toys and other items with them, especially once you get to the new pad! 3. Check out your new place. Before letting your dog loose in the new place or in the new backyard, make sure to do a thorough walk through of both. Walk the perimeter of the yard and make sure it looks safe for your pooch. Keep them in their crate or confined area until all the people/movers are finished moving; escaping in a new area could be especially dangerous and scary for your dog. 4. Beware of moving hazards. Especially with puppies, make sure that they are being supervised around all of your boxes. Boxes can be very tempting to chew up and there might be things inside the boxes that you don’t want your dog chewing on! Also, specifically with small dogs, be careful when moving furniture and other heavy objects, you don’t want your dog to get in the way and possibly get injured. How have your dogs reacted and adapted to moving? My dogs will be going from a house (which is all they’ve ever known) to an apartment, any specific tips for me? Coursing Your Young Dog – How Much Is Too Much? We start bringing our puppies out at a very young age, pretty much as soon as they are comfortable and settled in our home, from nine weeks on. We are, however, careful about exposure to other dogs and coyotes, since the puppy is not fully vaccinated yet. When they are that young, they will not normally venture very far from you and it is a great opportunity to work on recall training. We also take the young pups out at an early age to let them learn how to navigate in varied terrain, how to fall and roll (their bones are soft and forgivable at this time), and to learn that the world is not flat! Nine weeks to 16 weeks is a good time for them to learn how to leap over bushes, run around bushes, ditches and avoid obstacles. At this time is when the puppy starts to get used to everyone yelling “rabbit!” and all the dogs running off, but they most likely will not try to run after the other dogs (or if they do, they won’t get very far!). Slowly as your puppy grows they will be able to follow the other dogs farther and farther. Every dog is different; you will need to learn how they run and pay close attention to them when they come back from courses. Under a year of age, they will most likely not be able to go the entire distance that the adult dogs do (especially on long courses). You also want to pick and choose whom your young dogs run with. Sometimes an older dog is a good choice so that they don’t get on super long courses and overtax themselves. For example you wouldn’t run a young, large, gangly male with your top dog, because it is the longer courses where they can injure themselves especially if they get tired and won’t quit. If they are able to keep up with the adult dogs and it is a really long course, it is probably best to leash up your young dog and not allow him to run any more courses. However, if they are running a bunch of short tail chases, your young dog will most likely be able to stay out with the adult dogs most of the time. There is concern for young developing dogs, especially the larger males, so generally we tend to hold them back at about nine months through 13-14 months of age. In other words, we limit their coursing time in the field to avoid injuries, especially ones that can be lifetime injuries such as a soft tissue or growth plate injury. Dogs in this age range think they can run harder and faster than their bodies can really handle so careful exercise is essential to avoid potential problems. If you have a young dog that will quit at nothing to get that hare and rarely give up in a course, then you have to watch that dog more closely and make sure that they don’t push themselves too much which might result in injury. Some signs that your dog has had a “trasher” course or ran too hard (and should be leashed up for a bit) are: bloody urine (strenuous exercise can cause additional protein buildup in urine), walking wobbly or muscles cramping up. If your dog’s muscles are cramping, they will most likely want to lie down; make sure to keep them walking around (to prevent more or excessive cramping) and vigorously rub muscles with your hands. If any of these are happening with your dog, definitely leash them up until they seem fully recovered, and it is also a good idea to give them some Nutri-Cal or K9 Super Fuel to help them recover faster and get some nutrients into them. If you start competing with your young dog (they must be at least one year old to compete) in Open Field Coursing, the most that they will run in a single day is normally twice (with breaks in between the courses), therefore, monitoring how much they run will be much easier. However, if you have a young dog who is entered in a two-day hunt, and had two trasher courses the first day, you will want to make sure that they are not pushing themselves too much (to prevent injury) and the best way to do that is to go with your instinct and know your dog. In those cases, it is usually best to pull your young dog from the hunt the next day. Always better to be safe than sorry, your dog’s safety and health should always come first before any competition. 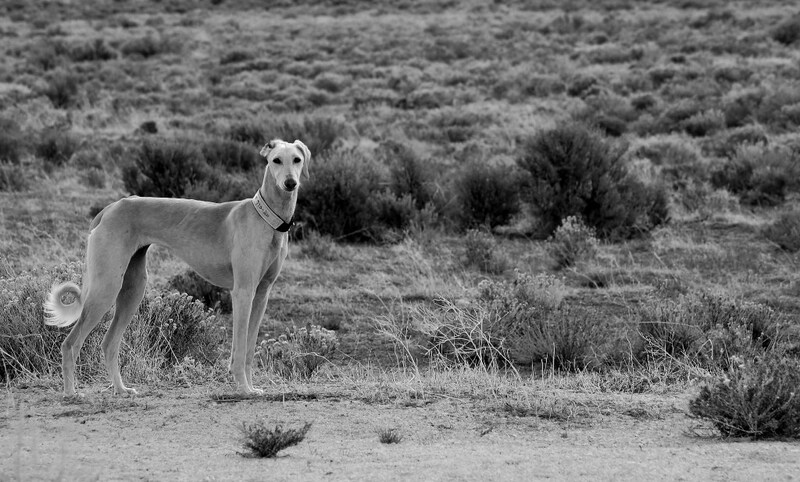 How much do you push or hold back your young dogs when out coursing? Hi my name is Lauren Chen. I am a business management student interested in the veterinary field who has extensive knowledge and a burning passion for hunting, showing, and breeding dogs. Welcome to my blog where I will be talking about these passions.